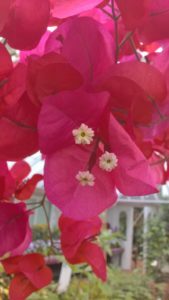 Bougainvillea is a subtropical, thorny climber originally from South America but it is now commonly found in Mediterranean regions as a garden plant. It is the national flower of Guam in the western Pacific. They are grown for what appear to be flashy flowers but these are actually modified leaves (bracts) surrounding the tiny white flowers. The bracts can be pink, red, orange, purple, yellow or white. These colours attract hummingbirds, butterflies and moths which drink the nectar from the tubular, white flower and accidently carry pollen on their bodies, distributing it among nearby plants. This ensures pollination; essential for seed production in the wild. In the U.K, they must be grown in a glasshouse or conservatory as they will not tolerate frost. A winter temperature of 5C to 10C is ideal and encourages the plant to lose its leaves. A dry period is also needed during the winter, when they should be watered once every two to four weeks or so. No fertiliser should be given during this time. In mid-February, spur pruning is required to encourage flowers and to restrict its vigorous growth; all side shoots should be pruned to 5 buds and the top to the desired height. In March, more water should gradually be given and come mid- April a weekly feed of high nitrogen will encourage lots of leaf and stem growth. Once flower buds appear in May and start to colour up, a weekly high potassium feed during the whole summer will encourage better flowering. When flowering decreases in September, feeding must be stopped and watering gradually reduced again.